Below is a very brief summary of what is in each issue. There is much more than what is listed. 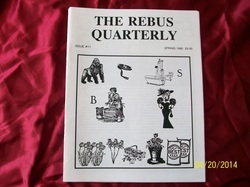 Each issue is loaded with hours of rebus puzzles to solve. 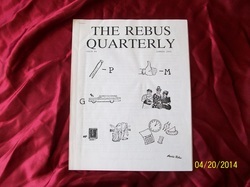 You'll soon be on your way to being a Rebus expert! 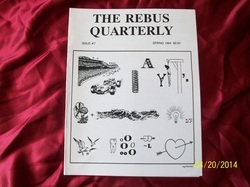 "Rebus Techniques" column discusses "cut-apart" and "overlapped" words. 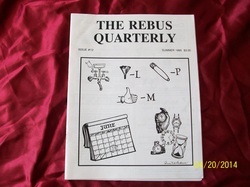 Other features include Advanced Rebus Play (song titles), The Rebus Spotter, a cryptoquote letter, a "numbers" puzzle, plus regular columns including reader rebus mail, etc. 16 pages. 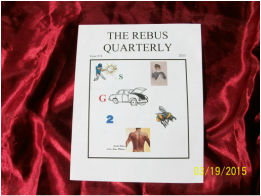 Rebus Book Review, The Rebus Spotter, Trivial Rebus Pursuit, 3 pages of Advanced Rebus play, 3 pages of Reader Mail, a 6-page rebus by one of our readers, and Dear Auntie Rebus, etc. 24 pages. Word Search puzzle and more. 28 pages. 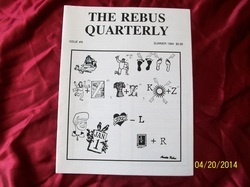 Rebuses, Placement Rebuses, Book Review, Rebus Spotter, Reader Mail and more. 28 pages. 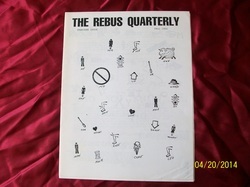 Includes amazing Bottle Cap rebuses, Rebus Crossword Puzzle, Rebus Finds, a cryptoqoute, Stamp Company Review, Reader Mail and more. Extraordinary cover. 28 pages. 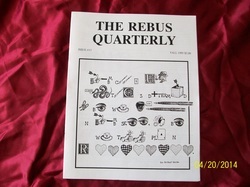 Rebuses, Rebus Game Review, and more. 28 pages. 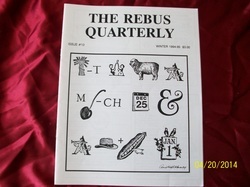 Rebus Set Review, Guest Rebuser, and more. 24 pages. Mounting System and more. 24 pages. Book and Game Review, and more. 20 pages. 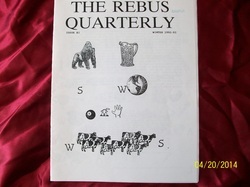 Antique rebuses, Foreign Rebuses, Book Review, reader submissions. 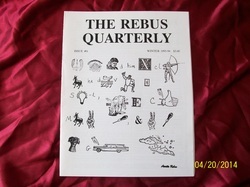 Outstanding cover rebus. 20 pages. This issue is now in progress. 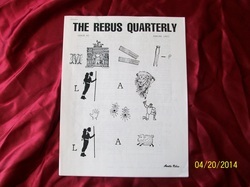 Articles will include Latest Rebus Sightings, How technology has affected rebusing, Modern Day Rebusing, How your misspellings are actually a misguided rebus, Rebus Site Reviews and links, Rebuses in the Media, Rebus Term Dictionary with examples (a valuable learning tool) and Rebus News. 20+ pages and No ads!